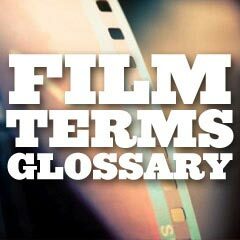 Film Terms Glossary: Oftentimes, film-making terms are not clearly defined for the average person. In order to be knowledgeable about the movie-making art form and the techniques of cinema, one must understand the fundamental vocabulary and language of film studies. Therefore, some of the most basic and common terms are defined in this compendium for reference. Simple definitions are provided for often complex terms as a baseline for media literacy. Illustrations and examples from films are provided with many of the terms, to help describe them more fully. Tips for Critically Viewing Films is also provided by this site. This is not a complete collection of all film-making terms, because so many of them are too obscure or technical to be included. However, this listing should provide enough background for a majority of the important terms, and prompt the reader to research them further. When discussing film and the creative craft of film-making, many of these terms are used to describe the complicated and expensive process or task of making movies - from conception to finished product.